More new immigrants came to Maine from Iraq than any other country in 2014. China was the no. 2 source. That’s according to a new report from Pew Trusts, which used data from the Minnesota Population Center to illustrate the top two origin countries of new, documented immigrants to each state in the map below. Immigrants from China and India are increasing in numbers nationally while fewer are coming from Mexico, Pew says. The report cites an increase in Chinese and Indian college students, about 60,000 in 2014-15, who often find U.S. jobs after they graduate. 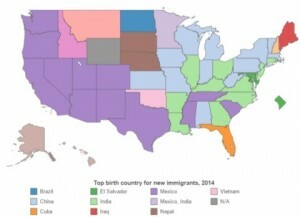 Ten years ago, most states saw the largest number of immigrants coming from Mexico. But as construction dried up and the recession hit, fewer Mexicans came to America for jobs. So that explains China, but what about Iraq? In 2012-14, Iraq was the main source of refugees coming to Maine. Federal data showed 429 Iraqis resettled in Maine during that period. Somalia had the second-most refugees to Maine at 390 over those three years. According to the Pew report, Maine was the only state to have the most immigrants come from Iraq. According to the Pew report, Maine was the only state to have the most immigrants come from Iraq. Pew Charitable Trust. 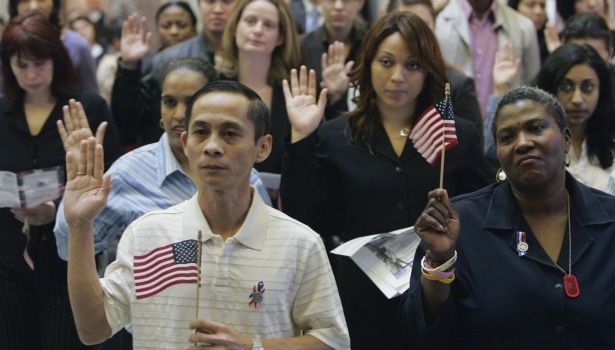 The study looks at the newest immigrants, people who have been in the U.S. for less than a year. Somalis didn’t even rank, because many have been here a decade or more and many lived elsewhere in the United Stated before moving to Maine. The Minnesota Population Center data show 7,579 new immigrants in Maine in 2014.